Click to view full-size poster. 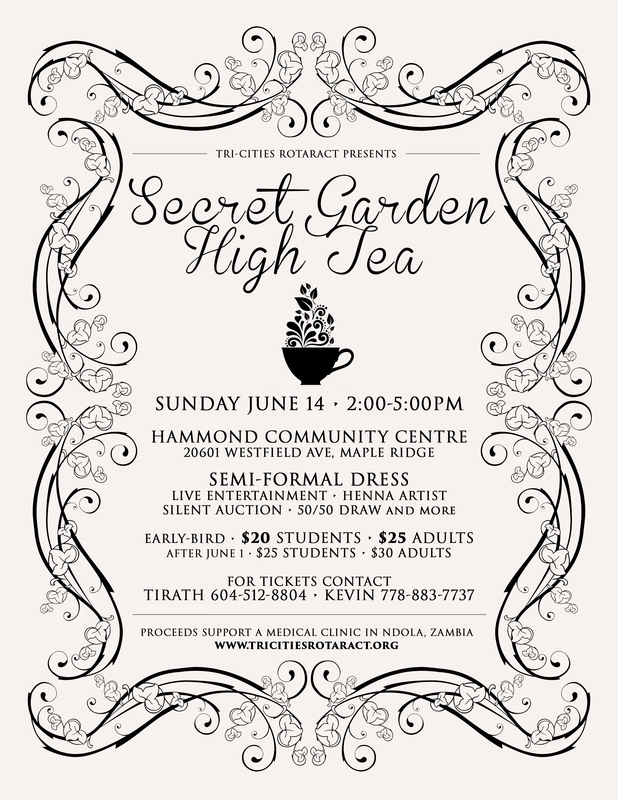 Our International Service Committee organized a high tea event on Sunday, June 14 complete with live entertainment and tasty treats. In total, we raised $2,000 for a medical clinic in Ndola, Zambia! Thank you to everyone who supported us – especially the Rotary Clubs of Port Coquitlam Centennial, Central City, Port Moody, and our friends from the District 5050 Rotary Youth Leadership Awards. Pictures from our photobooth are available on our Facebook page. Once again this year, our club endeavored to help out a local family in need this Christmas season by putting together a hamper filled with groceries and gifts. We’d like to thank Safeway at Sunwood Square in Coquitlam, and Thrifty Foods at Suter Brook in Port Moody, for their donations as well as the many parents within our club who contributed too. 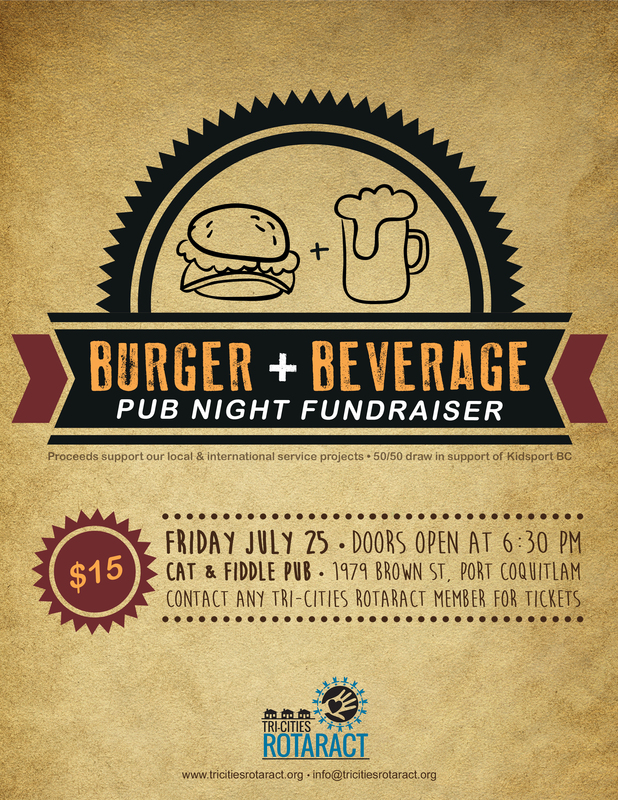 Back by popular demand is our second annual pub night fundraiser at the Cat and Fiddle Pub in Port Coquitlam. Once again, for $15 you can enjoy your choice of burger (beef, chicken, or veggie) and beverage (highball, beer, or wine). Proceeds will support our club’s service initiatives for the upcoming year, both in the local community and abroad. There will also be hosting a 50/50 draw with proceeds supporting Kidsport BC! We are looking forward to spending an evening with everyone! 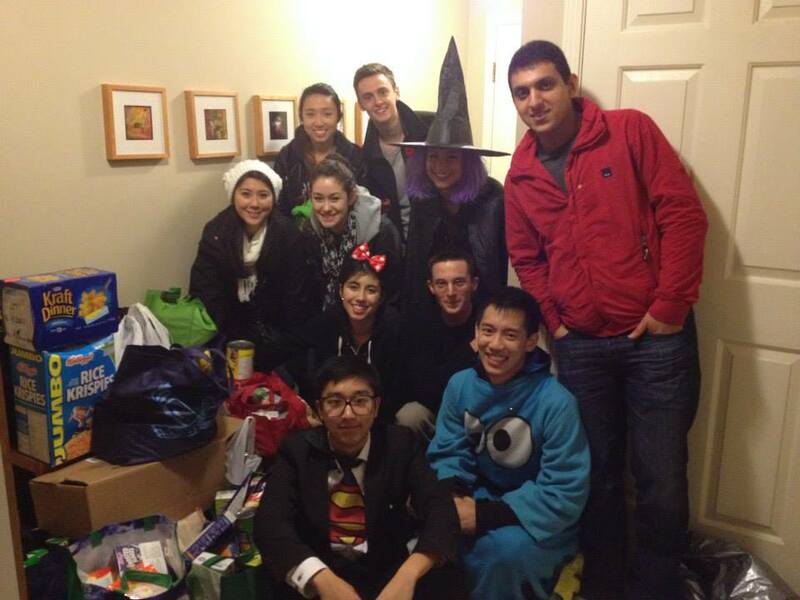 After the success of the event last year, on Halloween this year we once again collected nonperishable food items from neighborhoods in Port Moody to support local food banks. Just an hour and a half of collection with our group of volunteers led to over 400 items of food being collected for SHARE Family & Community Services. 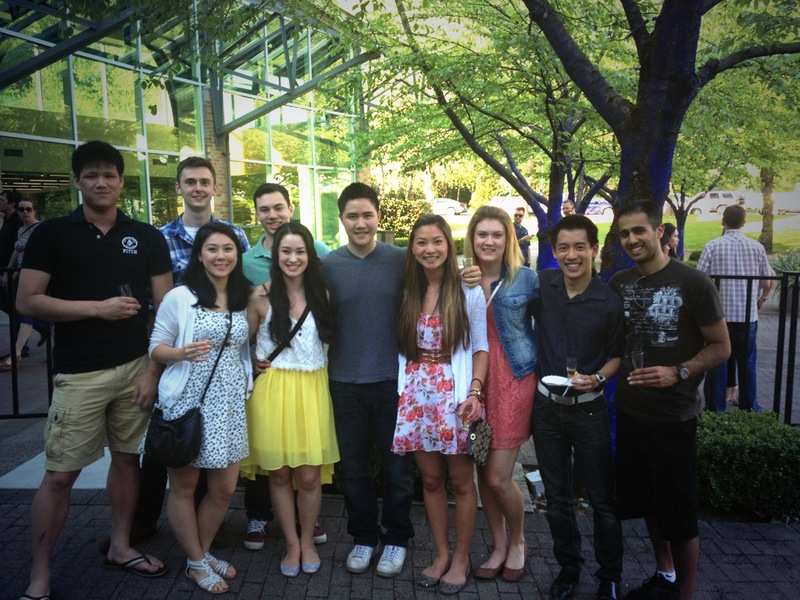 Thank you to our team of volunteers: Ryan, Danielle, John, Adam, Kim, Chantal, Jordan, Janelle, Emi, Kevin, Nicole, and Chris! 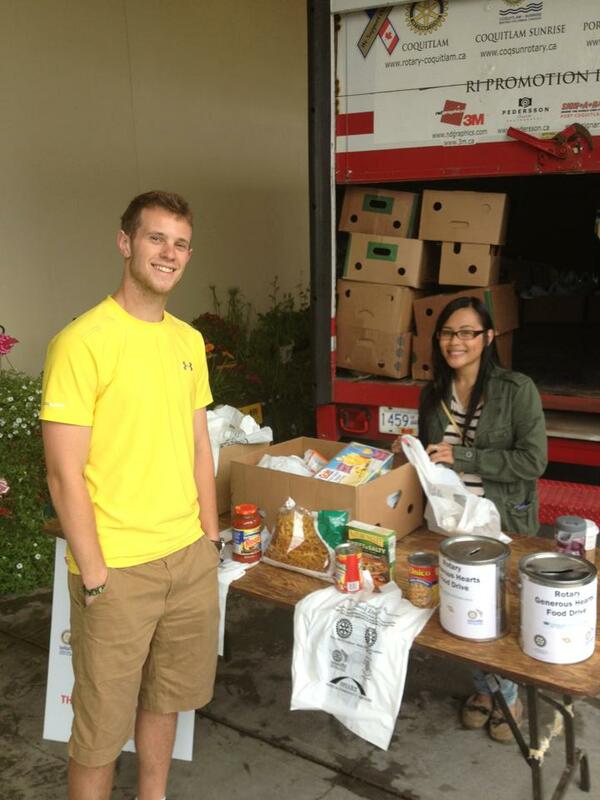 Update: We’re happy to finally report the total from this year’s We Scare Hunger can drive in the Tri-Cities: 537 lbs! This improvement over last year’s amount of 512.5 lbs would not have been possible without all of our awesome volunteers and the generous donations of Tri-Cities residents. Check out more photos from this year’s event on our Facebook page. 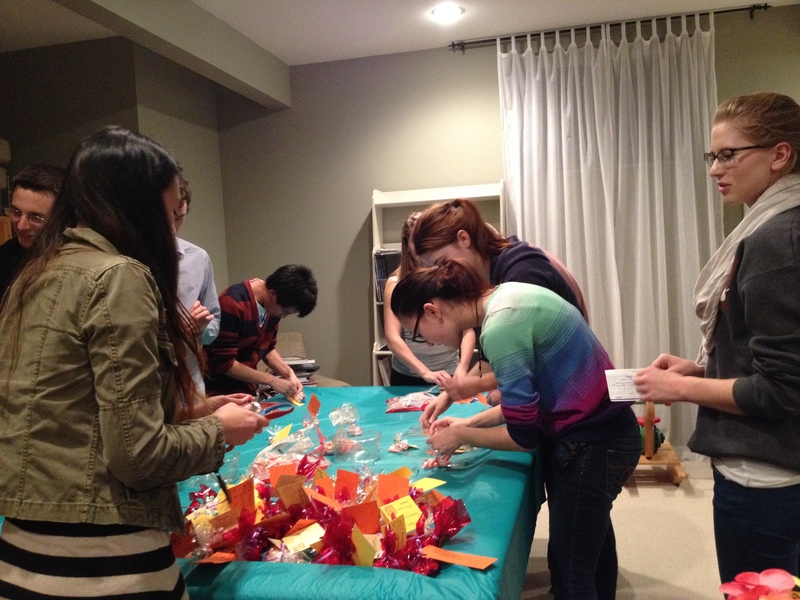 Stuffing candy bags at our meeting to give to the guests. Often we have so much to be thankful for during the Thanksgiving season that we forget about others in our community who may be less fortunate. 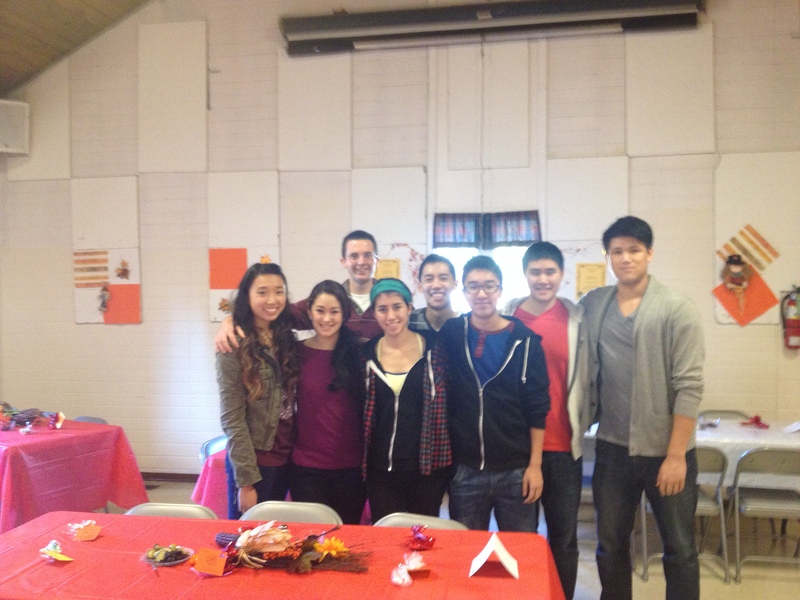 This year, our members were determined to spend the long weekend doing something valuable for the community, and we were very fortunate invited by the Rotary Club of Port Coquitlam Centennial to help out with a Thanksgiving lunch held in Port Coquitlam in partnership with St. Catherine’s Anglican Church. Emi and Ryan working on the mashed potatoes. Preparations began the week before at our October 10 meeting, when we stuffed bags of candy to give out to guests. Then on Thanksgiving Monday, we were up bright and early to help the Rotarians and members of the church prepare a menu of roast turkey, gravy, stuffing, mashed potatoes, salad, and pie. 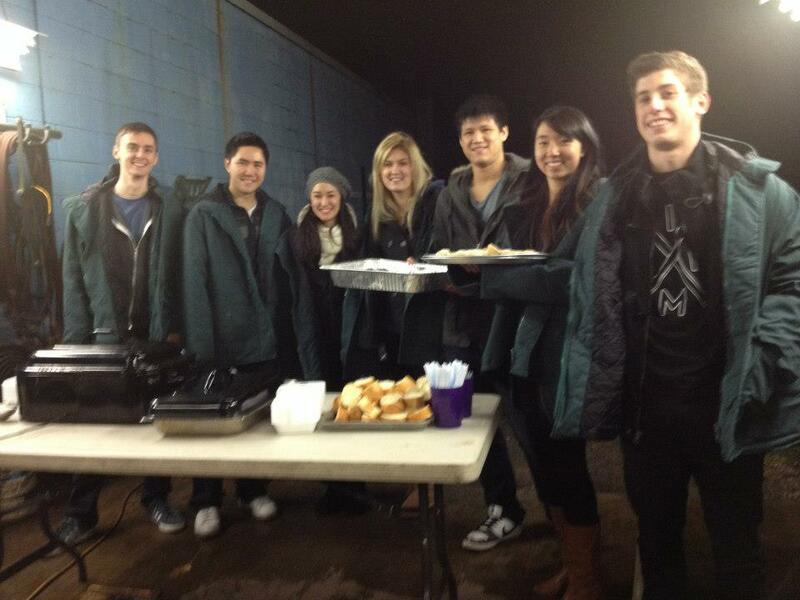 We also had the honor of serving the meal to the guests. We were so happy to be able to spend part of Thanksgiving giving back to the community – thank you to the Port Coquitlam Rotary and to St. Catherine’s Church for allowing us to help out! Our first-ever pub night event at Port Coquitlam’s Cat and Fiddle Pub on Friday, July 5 was a fantastic success, with the event being a complete sell-out! For $15, our friends and guests enjoyed their choice of burger and beverage. We also held a 50/50 raffle and a toonie toss to raise additional money. A grand total of $1554 was raised from the event. Thank you to everyone who supported us that evening – your donations will make a difference both in our community and around the world! 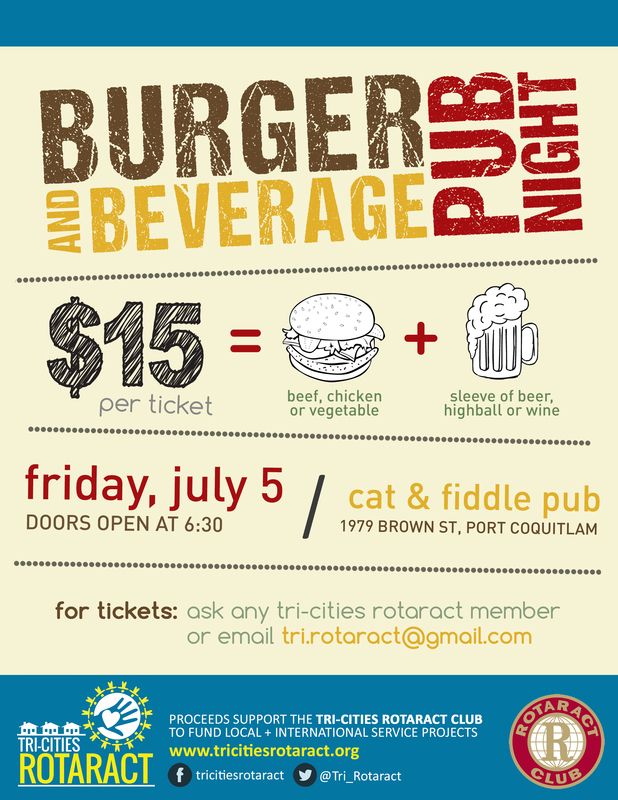 The Tri-Cities Rotaract Club is pleased to be hosting our first pub night fundraiser on Friday, July 5. For $15, enjoy your choice of a delicious beef, chicken or veggie burger, and a sleeve of beer, highball or wine at the Cat & Fiddle Pub in Port Coquitlam (1979 Brown St). All proceeds support our club’s local and international service projects! We will also be hosting a 50/50 raffle as well as a toonie toss! For tickets, ask any member of the Rotaract club or email us at tri.rotaract@gmail.com. We look forward to having a great time with you on July 5! Doors open at 6:30pm. Click to view hi-res event poster. Alex and Jordyn helping at the donations table. On the weekend of May 25-26, members of the Tri-Cities Rotaract volunteered to man the booths at the Coquitlam Safeway in Sunwood Square for SHARE Family & Community Services‘ annual Generous Hearts Food Drive. The event was, as usual, a great success this year with 12,076 pounds of food and $4,528 raised to help families in need! 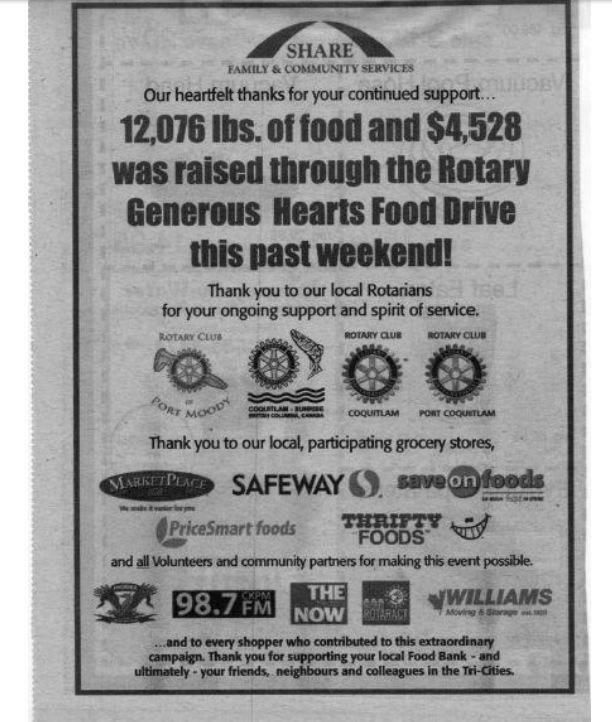 Thank you to SHARE, the Tri-Cities Rotary Clubs, the sponsors of the food drive, as well as the many customers who made generous contributions that weekend. 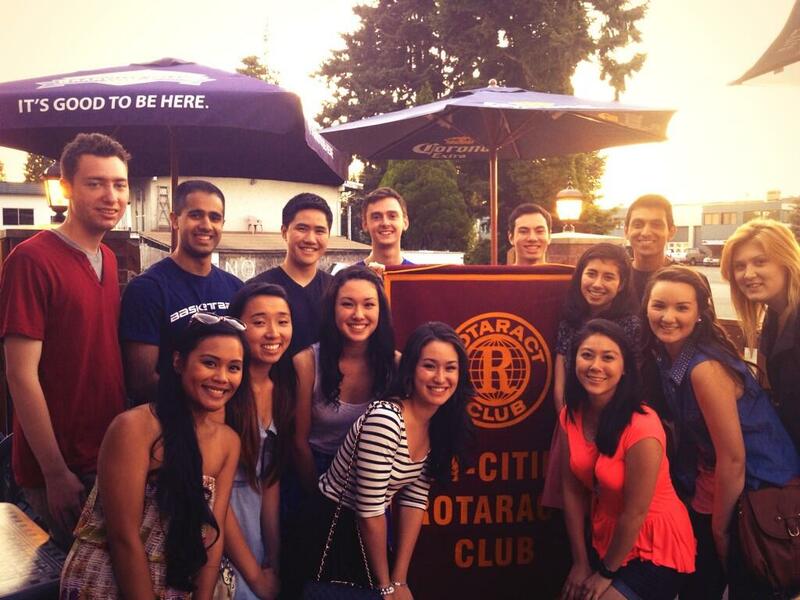 Members of the Tri-Cities Rotaract Club enjoying delicious food and brews at this year’s Search for the Perfect Pint. Our sponsoring club, the Rotary Club of Port Moody, held its annual Search for the Perfect Pint fundraiser at the Port Moody City Hall on the evening of May 9, and graciously invited our club to attend. Guests were able to sample a huge variety of fine brews from Howe Sound Brewing, Central City Brewing Company, Vancouver Island Brewery, Steamworks and many more. There was also plenty of delicious food provided throughout the evening including sliders, beer ice cream, and tempura bacon. We all had a fantastic time supporting Rotary and would like to thank our sponsor club, as well as the other Rotary clubs in the Tri-Cities, for the wonderful partnership that we have been able to establish. Since November 2012 we have been regularly hosting a free dinner for the less fortunate in the Tri-Cities every month. 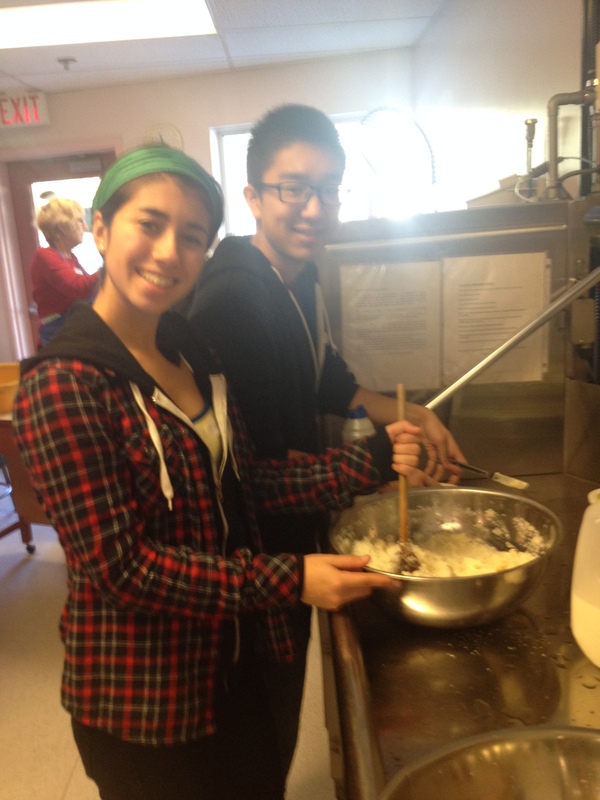 Previous menu items have included perogies, chilli, and rice krispie squares made by our very own members! In addition to cooking up the food we also host and serve everything ourselves. We look forward to hosting many more of these in the future!